Philipp Pattberg is professor of transnational environmental governance and policy at VU University Amsterdam, The Netherlands. He specializes in the study of global environmental politics, with a focus on climate change governance, biodiversity, forest and marine governance, transnational relations, public-private partnerships, network theory and institutional analysis. Pattberg’s current research scrutinizes institutional complexity, functional overlaps and fragmentation across environmental domains (http://fragmentation.eu/). Pattberg has authored, co-authored or edited 8 books, and published 40 articles in peer-reviewed journals and 35 chapters in academic books, along with more than 80 papers, reports, and contributions to policy-oriented journals. His most recent publication is the Encyclopedia of Global Environmental Governance and Politics (co-edited with Fariborz Zelli, Edward Elgar 2015). Pattberg’s research has been cited over 3200 times, and his Hirsch-index in Google Scholar is 27. Several of his papers belong to the top-10 most cited papers in their respective journals. 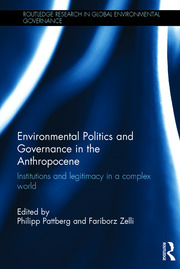 Pattberg is the co-editor (with A. Kalfagianni) of the Routledge Research Series in Global Environmental Governance, and reviewer for more than 20 academic journals. His work has appeared, among others, in Ambio; Annual Review of Environment and Resources; European Journal of International Relations; Global Environmental Politics; Global Governance; Global Policy; Governance; and Science. He also regularly serves as reviewer for research foundations and universities in Europe and North America and Australia, and has been an invited speaker at universities, companies and public agencies from Paris to St. Petersburg. At VU University Amsterdam, Pattberg heads the Department of Environmental Policy Analysis, a team of more than 25 researchers that was evaluated in a 2014 international review as ‘world leading’ and as being ‘one of the highest profile academic research groups involved with sustainability governance from around the world’. Pattberg is Chair of the Board of the Global Environmental Change Section of the German Political Science Association (http://www.ak-umwelt.de/) and a senior research fellow of the international Earth System Governance Project http://www.earthsystemgovernance.org/). Within the Netherlands Research School for Socio-Economic and Natural Sciences of the Environment (SENSE), Pattberg co-coordinates the research cluster on global environmental governance and politics. From 2006-2011, Pattberg was the deputy-director of the Global Governance Project, a joint research program of 12 European institutes with about 40 affiliated researchers (www.glogov.org). Earlier professional or visiting affiliations include American University (Washington DC), the Freie Universität Berlin, the London School of Economics and Political Science (LSE), SciencesPo Bordeaux, and TU Darmstadt. Pattberg has 12 years of teaching experience in Germany, the Netherlands, the United Kingdom, and the United States. At present, he teaches in the MSc Environment and Resource Management and the specialization Global Environmental Governance in the MSc Political Science at VU University Amsterdam. He is currently supervising 9 PhD students.